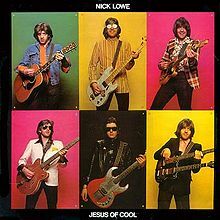 Nick Lowe – Jesus of Cool – But Is It Any Good? LINEUP: Nick Lowe, mostly backed by Dave Edmunds, Billy Bremner and Terry Williams, but other UK New Wave stalwarts appear. SOME WORDS, PHRASES AND CLAUSES ABOUT THIS RECORD: Lowe is probably more famous in the US for his second album, and “Peace, Love and Understanding”, and maybe his work in Rockpile. This record, though, is great and shows what promise the new wave had in upsetting the establishment. Songs about a former actress, Castro, the Bay City Rollers and even record labels make for a fun listen. The music is a bit pub-rocky at times but there’s an energy and drive thanks to Dave Edmunds and Rockpile. For some reason, it was re-titled and re-sequenced in the US. In some ways, it was a better album (T”hey Called It Rock” a better version of “Shake and Pop”, really). I think the title threw off us naïve Americans. NOTES & MINUTAE: Lowe wrote “(What’s So Funny About) Peace Love and Understanding”, which Elvis Costello basically made his own. GRADE: A- : It’s almost an A but the slower ballads drag it a bit. I wanted the energy to keep going!